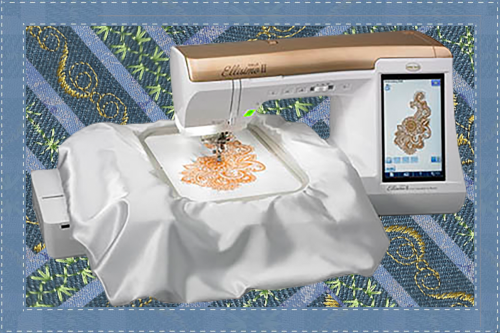 Take a creative journey into luxury with the Baby Lock Ellisimo Gold with II upgrade embroidery and sewing machine. This is the Baby Lock machine with the most features powered by Baby Lock IQ Technology™. That means you get quick auto-adjustments for hassle-free embroidery. Enjoy easy on-screen editing and hundreds of built-in designs. It’s easy to customize home décor, children’s clothes, and more with your favorite embroidery. The Ellisimo Gold II is great for sewing projects, too. Built-in stitches and the Multi-Function Foot Control make it easy to sew garments, quilts and more. For every project, the Ellisimo Gold II will take your inspiration to reality.